Our upcoming events for this October! 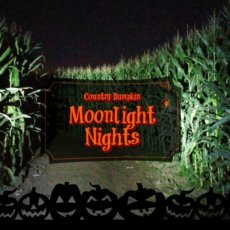 On the night of October 6th, 13th, and 20th, we will be open from 6pm to 9pm or later, for our Moonlight Corn Maze and Hay Wagon Rides! You can come around 4:30 pm to purchase special event wristbands and get time to play in our Play Village & Petting Farm! 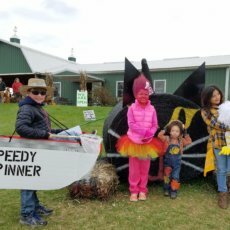 Once darkness takes over, the fun begins with both Hay Wagon and Train Rides all around the farm with a friendly ghost or two helping us along the way! Bring your flashlights for the moonlight corn maze! It is full of fun trivia questions to either help or hinder you, mwaahahahaaaa (!!!) We host campfires and complimentary s’more making, yum! New this year, we are planning on having a bounce house or two! Our concession stand will be open with made-to-order 12″ pizzas, hot dogs, nachos, hot apple cider, hot chocolate, and coffee. Come join us for a really fun night for kids and adults of all ages! Includes: play village & petting farm (until almost dark), corn maze, one ride on either our farm train ride or our haywagon, small bonfires with s’mores, and bounce houses! Please Note: Our Moonlight Nights are not scary. We do have a few blow up decorations in the fields for our rides, but there are no actors who will run out and scare children. Glow necklaces will be available to purchase in our store. We want to offer something fun for all ages! See you all there! On the nights of the events, if there is a chance for rain, please check our Facebook page for cancellation/rescheduling updates. Thanks! Think your kid (ages 2 – 12) has the cutest, scariest, or most creative Halloween Costume? Dress them up and come out to Country Bumpkin to enter them into our Halloween costume contest!!! All registered contestants in costume will also receive free admission to our Lil’ Bumpkin Play Village & Petting Farm for that day! Regular admission fee ($6.00 per person) applies to all adults and children not entering the contest.